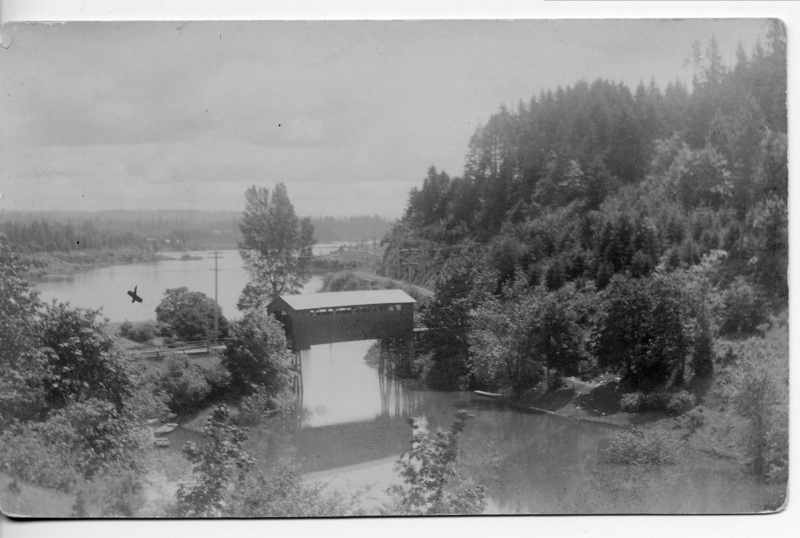 [postmark] OSWEGO, OREGON APR 23 4 PM 1909; Bridges; Large stream marked X Willammette [sic] River; County road right along river. - on way to Oregon city five miles away. Bridge Crosses a stream which empties into Wilammette [sic] river. [address]: Mrs. E. B. Fisk (Fish ?) 623 East 29th St., Los Angeles, Calif. Description Sepia photo scanned as B & W. Same as 83a & c and 728a & b. The Old River Road Bridge is now a footbridge in George Rogers Park. Transcription [postmark] OSWEGO, OREGON APR 23 4 PM 1909; Bridges; Large stream marked X Willammette [sic] River; County road right along river. - on way to Oregon city five miles away. Bridge Crosses a stream which empties into Wilammette [sic] river. [address]: Mrs. E. B. Fisk (Fish ?) 623 East 29th St., Los Angeles, Calif.